Another session gave the students a list of ten values, such as success, integrity, joy, wisdom, and love, as well as some blank spaces for them to add their own if they wished. They were asked, “Narrow your list, first to eight values, then to five, then to three, and finally to your top two core values.” The group discussed those core values and what they meant to the students. The facilitators then asked the students to reflect on those values in the week ahead. After a week of self-reflection, a number of students came to the following session saying that they had changed their two core values and explained why. Over the course of these sessions, facilitators ensured that all information was kept confidential and urged students not to repeat it outside the meeting room. Students opened up about their worries–both personal and academic. But can this sort of program really prove effective across the board? Is reflection really so important that we need to carve out precious space in our curricula for it? Let’s see what the research has to say. In October 2014, researchers at the University of Texas-Austin found that restful reflection strengthens the process of learning and memory formation in the brain. Margaret Schlichting, a graduate student researcher, and Alison Preston, an associate professor of psychology and neuroscience, gave participants in the study two learning tasks in which they were asked to memorise different series of associated photo pairs. Between the tasks, participants rested and could think about anything they chose, but brain scans found that the ones who used that time to reflect on what they had learned earlier in the day fared better on tests pertaining to what they learned later, especially where small threads of information between the two tasks overlapped. Participants seemed to be making connections that helped them absorb information later on, even if it was only loosely related to something they learned before. Preston says her findings could help teachers design more effective ways of teaching. For example, imagine you are teaching students about how neurons communicate in the human brain, a process that shares some common features with an electric power grid. You might first ask students to reflect on things they learned in a high school physics course about how electricity is conducted by wires. 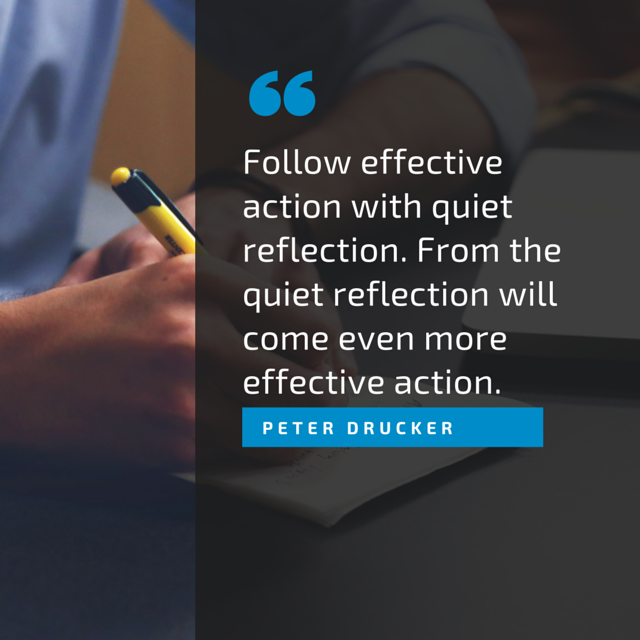 The benefits of a reflective learning environment appear to be countless. At Oakland University, Elizabeth G. Allan and Dana Lynn Driscoll have been analysing how reflection can aid in assessment, student learning, and professional development. They’ve found that a reflective learning environment yields insights into students’ writing processes, promotes metacognition and transfer of learning, and reveals a variety of professional development needs. It also doesn’t matter whether the shared reflection occurs in person or online. In 2014, researchers from the National Taiwan Normal University and Taiwan Shoufu University found that virtual, instructor-led reflection can be just as effective as face-to-face instructor-led reflection. The study proposed a cloud-based reflective learning environment to assist instructors and students in developing and strengthening reflection ability during and after actual course sessions. An additional experiment was conducted to evaluate the effectiveness of the proposed approach in an industrial course. Results showed that the learning environment developed by the study was able to effectively facilitate student reflection abilities and enhance their learning motivation. Metacognition is simply an awareness of our own thought processes, so sharing academic work with others is a natural way to spark reflection. “Sharing their achievements helps those who struggled with that particular task, and sharing their weak spots helps them troubleshoot as they work through a problem set or have a peer edit a rough draft,” Pahomov says. But it’s also crucial to practise awareness when you’re by yourself. The easiest way to encourage students to reflect metacognitively in their own time is to give them the tools to do it. Finally, Pahamov suggests that reflection ought to be shared. To make students more comfortable sharing, the learning environment must be a place “where each student is recognised as being on an individual path of improvement… and that no student has reached the end of the path, because there is no end.” If there is no end, Pahamov says, it becomes more difficult for students to compare their relative positions on the journey. Along with creating a collaborative setting, experts also say that an “authentic” learning environment can lead to greater reflection.